Ing. Marek Radvanský, PhD., doc. Ing. Iveta Pauhofová, CSc., RNDr. Viliam Pálenik, PhD., h.doc., Ing. Ivan Lichner, PhD., Ing. Veronika Hvozdíková, PhD., Ing. Boris Hošoff, PhD., Ing. Gabriela Dováľová, PhD. The European Union is experiencing intense population ageing caused by increasing life expectancy and low birth rates. This trend is considered to be one of the major challenges affecting EU competitiveness in world markets, as well as the potential for economic growth and employment. Gradual transformation of social systems is increasingly necessary, because their current form is not structured to withstand a higher financial burden induced by the prolongation of retirement, an increased demand for health-care and long-term care for the elderly. A majority of the existing scientific analyses is focused on the negative consequences of ageing with regard to public finances. Less attention is paid to the impact of ageing on the national economy parameters in terms of the changes in the volume and structure of demand and supply of products, services, labour and capital. The objective of this publication is to provide the reader with broader perspectives of the Silver Economy. New market opportunities initiated by an ageing population are mentioned in the current literature more frequently than before, but such a complex analysis of the Silver Economy as provided here is still an exception. The first chapter represents a basic macroeconomic framework for the introduction of the Silver Economy, with the focus on the debt crisis and on causes of eflationary tendencies. It highlights the fact that, at times of demand and consumption crisis, it is important to find new pro-growth factors that could transform impulses from macroeconomic policy and structural reforms to higher economic growth and job creation. In this context we have to pay attention to both negative and positive consequences of population ageing. 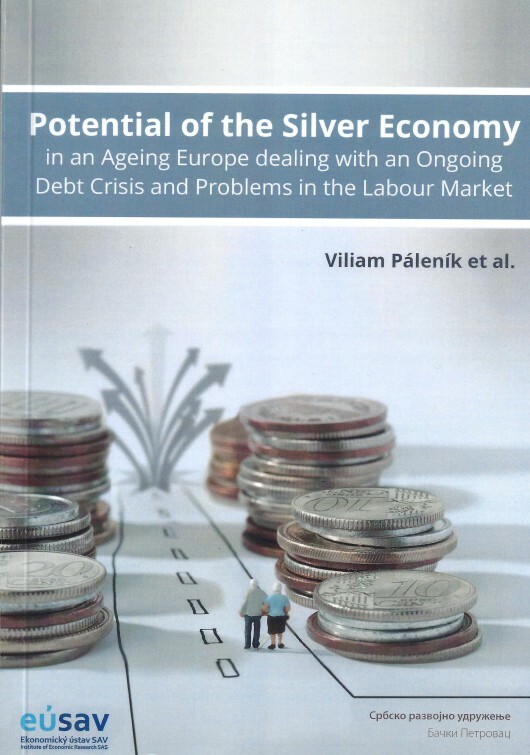 The second chapter contains a definition of the Silver Economy and provides an overview of literature dealing with economic dimensions of population ageing. This chapter provides an overview in areas such as purchasing power, savings and consumption as well as new market opportunities for innovative companies responding to the needs of older people. Attention is paid also to the promotion of the Silver Economy at the European level. A case study at the end of this chapter presents the potential, opportunities and barriers in segments of spas and spa tourism – which we find to be a typical sector of silver industry in Slovakia. The third chapter provides an overview of the latest tendencies and demographic trends in Europe. It compares the ageing process in various geographical regions of Europe, briefly presents the ageing trend on a worldwide level and identifies emerging economies as those facing the highest dynamics of population ageing. Analysis of actual stages of demographic transition among major EU trading partners is used to point at potential export markets for silver goods produced in Slovakia or elsewhere in Europe. The fourth chapter deals with the context of an ageing population in relation to the formation of demand, because the trend of population ageing presents an opportunity for a saturation of needs, particularly in regions with high potential demand of older people. This chapter also provides insight into the differences and similarities in consumer behaviour of older people among individual EU countries. Particular attention is given to the consumer behaviour of older people in Slovakia. Model scenarios illustrate how changes in consumption patterns could affect employment in the EU. An important part of this publication is the results of modelling the medium-term effects of an ageing population on the Slovak Economy. These results are presented in the concluding chapter. Since the expected changes in the context of population ageing are complex in nature and involve a number of factors (such as changes in population size, changes in consumer behaviour, etc.) we have prepared a number of scenarios while the obtained results provide important information relevant for the formulation of economic policy in Slovakia.